VanBragt.Net Virtualization - Where is feature X in XenApp 6 located? Now Citrix XenApp 6 is on het market for a while and slowly but steadily Windows 2008 R2 64bit Terminal Servers are adopted more and more people are really starting and installing Citrix XenApp 6. Citrix finally accomplished the promise they made many years ago to create a single XenApp console. However this accomplished has caused that some features are moved to another location into the console or even moved out of the console in total. In this article I'm describing where the feature can be found or implemented based on my personal experiences. Installation Manager was already moved in XenApp 5 for Windows 2008, but not many companies moved to that version so most people still see Installation Manager as part of the Delivery Service Console. First of all in XenApp 6 Installation Manager does not support rolling out Citrix Installation Packages anymore, only MSI and MSP files are supported. Installation Manager nowadays is a separate installation that should be downloaded from Mycitrix.com (Installation Manager for Windows Server 2008 R2) and exists of 2 installations, IMUtilties which is kind of agent to install the application and IMAdmin that is used to setup the Installation Manager configuration. Actually Installation Manager is a set up MMC snap-ins, PowerShell scripts and using the Windows Task Scheduler. Because of this IM lost his capability to support a chronological installation order. In this article on ZenApp.blogspot.com a good overview is given how to install and configure Installation Manager. Also Resource Manager was already disappeared in the console within XenApp 5 for Windows 2008. In comparison with Installation Manager Resource Manager is actually really disappeared in the XenApp suite. The functionality is siphoned into Citrix EdgeSight. When you have a XenApp version which had Resource Manager functionality you are now allowed so use Citrix EdgeSight for XenApp to monitor the infrastructure. This version of EdgeSight does not offer all EdgeSight features, unless you have platinum licenses because then you can use all EdgeSight features. Personally I still miss Resource Manager a bit. It was much easier to install/configure as EdgeSight, requires less hardware/machines and was for most companies a perfect addition to current monitoring systems only for Citrix administrators to give them a real time overview of their infrastructure. In the previous advanced console several printer configuration settings where located. One of the settings was the printer driver replication option. This option is (again) not available in the console of Citrix XenApp 6. The printer driver replication is now available as PowerShell by Citrix or can be replicated using Microsoft Printer techniques available in Windows 2008R2. This Citrix KB article mentions both options including a link to the Powershell commands. I know in many infrastructures using Network Printer the Session Printers option is being used to import a print server and assign printer to user groups. This option is still available, but nowadays moved within the User Policies (under ICA\Printing). Actually a logical location because you would to assign printers on a user(group)basis. Also Printer Driver Mapping has been moved to the Citrix Policies and just like the Session Printers it's available under the User Policies (ICA\Printing\Drivers). Personally I don't find this is a logical location, because normally you won't assign another driver to another printer driver on a user/group basis. I would see this as computer setting. When you look to the policies you won't find a Zone Preferences and Fail over setting anymore. Also on the Zone tab nothing similar can be found anymore. Zone Preferences is replaced by a feature called Load Balancing Policies, which is available directly in the new console. With this option you cannot divide users over server between zones anymore, but you can divide users over Work Groups. So the actual zone load balancing is not available anymore and replaced by Workgroup fail-over functionality. This is actually more flexible, but if you are using zone preferences right now I advise to rethink your design (you can create a workgroup per zone to achieve the same result). In Citrix Presentation Server 4.5/XenApp 5 for Windows you had Isolation environments which were Citrix first steps in the application virtualization market. This Isolation Environments were not the way to go so Citrix decided quickly to lose the Isolation Environments and moved on the Application Streaming already in XenApp 5 and enhanced that in XenApp 6. The Isolation Environments feature is logically not available anymore in the consoles. This one got me for a few seconds. I opened the farm properties in the console and the only thing that was displayed was the configuration logging settings. Where all those options located? So I check the server properties immediately uuuhhhhh there are no server properties. 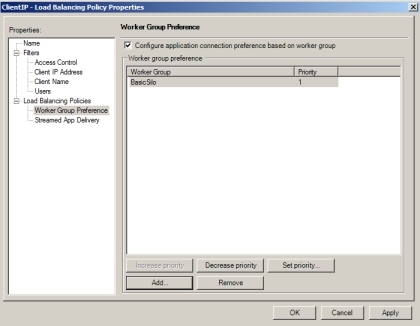 All the settings are (also) moved to the policies component, but this time logically to the computer part. Hopefully I pointed you to a feature where you thought it is not available anymore. As far as my experiences goes this are the features that are a bit more difficult to found that features that almost moved one to one into the new console. But maybe I missed that an option/feature is missing. If you know more just add a quick comment on this article and I will add to the article.